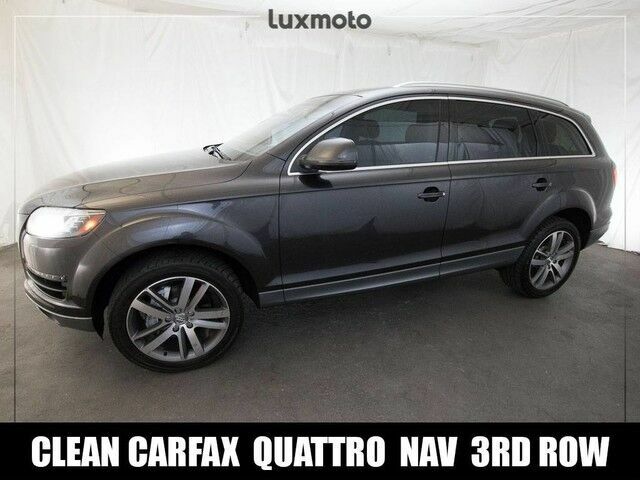 **CLEAN CARFAX**, Audi Q7 3.0T Quattro, **NAVIGATION**, **AWD ALL WHEEL DRIVE**, **BACK UP CAMERA**, **BOSE AUDIO**, **3RD ROW SEATING**, **PANORAMIC MOON ROOF**, **HEATED FRONT & REAR SEATS**, **BLUETOOTH**, **SATELLITE RADIO**, **MMI MEDIA INTERFACE**, Parking Sensors, Xenon HID Automatic Headlights, LED Daytime Running Lights(DRL), Fog Lamps, Rain Sensing Wipers, 4-Zone Automatic Climate Control, Milano Premium Leather Interior, AM/FM/HD/CD Stereo, Power Rear Liftgate, Auto-Dimming Rearview Mirrors, Tilt/Telescopic Steering Wheel, HEATED STEERING WHEEL, Proximity Keyless Entry with Keyless Start, Power Front Seats with Memory, Heated Door Mirrors, Homelink Garage Door Transmitter and more. Come see this Stout Q7 in our Indoor Showroom. The Q7 packs a lot of safety and luxury features into a large SUV. It's longer than almost any other luxury SUV, with lots of room for seven passengers in comfy leather seats. The NHTSA bestowed a 5-star crash-test rating on the Q7, and the IIHS granted it "Top Safety Pick" status. Opting for the TDI clean diesel engine adds extra value in the form of fuel economy, with 17 mpg in the city and 25 mpg on the highway. Strengths of this model include two new, more efficient gasoline engines, available TDI clean diesel engine option, luxurious interior amenities, Excellent multimedia interface, and excellent handling.